A rare, early 19th century Imari vase from Japan. Look closely at this piece and compare it to the later 19th century pieces. Notice the color and artistry difference. The panels are quite different while the area above them has a more typical Imari feel to them. Look even closer and one will see only 3 panels! This is exceptional as most pieces have an even number of panels. Overall, it stands 9 1/8″ tall and is 7 5/8″ in diameter. Japanese. Circa 1820-1850. An incredibly rare, 5 piece garniture set in Imari. While the 5 piece set was more commonly made in China, this set originates in Japan. Second, it is very rare to find a 5 piece set still together. (This is the only set we have ever owned!) The lidded jars are 12 1/2″ tall and 6 3/8″ in diameter. 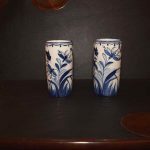 The smaller vases are 7 7/8″ tall and 4 3/8″ in diameter.